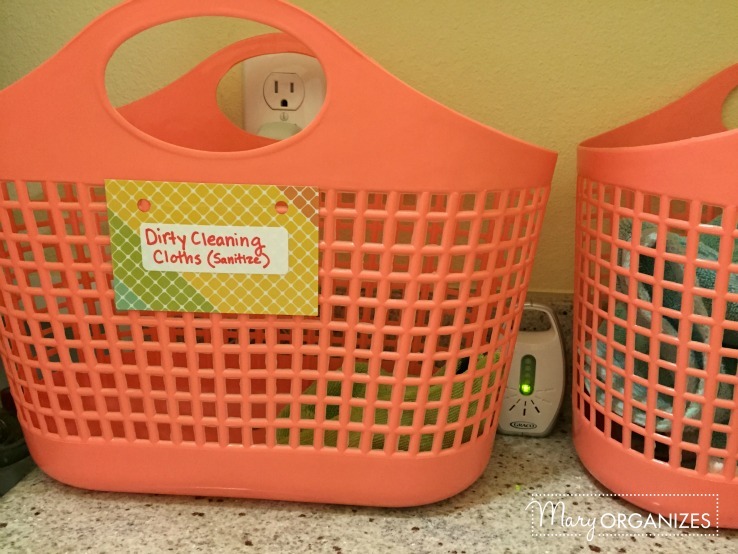 Why an Organized Laundry Room? It is not a myth, it is completely true: it is easier to do laundry in an organized and tidy laundry room/laundry area. 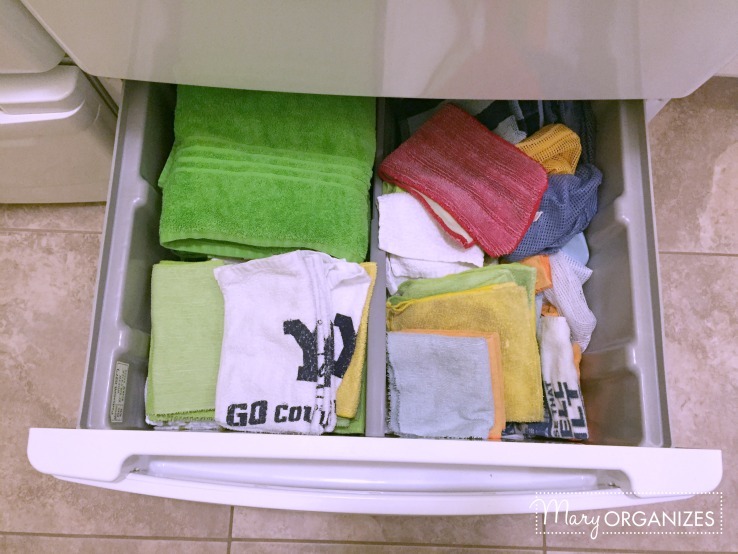 As I prepared the materials and blog post for the Laundry Room week of the Declutter Challenge, I reviewed some of what I’ve written about laundry in the past. I’ve come to the conclusion that I write a lot about laundry. I know from working in client’s homes, from many conversations with readers like you, and from what complaints I hear about at Mom’s Night Outs and Book Clubs – Laundry is awful for so many people. 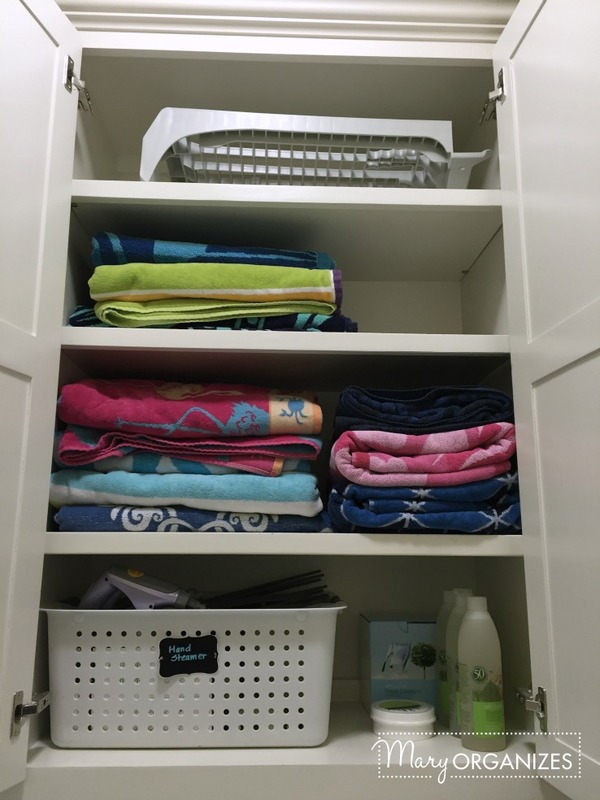 I’ve talked a lot about the systems for laundry maintenance before, but maybe I’ve failed to mention this simple truth often enough: Keeping your laundry room tidy makes laundry easier. My Laundry room is across from the Mud Area and next to the door to the garage. It sees a lot of traffic, so I believe keeping it as minimal as possible discourages clutter build-up on the flat surfaces. I just showed you this room last year, and it hasn’t changed much. I still want to show you because I thought it would be a lesson in how most change and improvement happens slowly over time (despite all of the before and after pictures you see on blogs). As luck would have it – today, the day I set aside to take the pictures and write this post, it was a rainy and dreary day here in Arkansas. There was no natural light to be found, so I had to turn on the overhead light which makes the room look yellow in some pictures. Oh well! Perfectionism is for old-Mary, I’m reformed-Mary. I changed up the stuff on top of my washing machine because I got rid of the bigger garbage can that was on the counter in lieu of this adorable counter-top garbage can on top of the washer. I use it for lint and pocket-garbage. 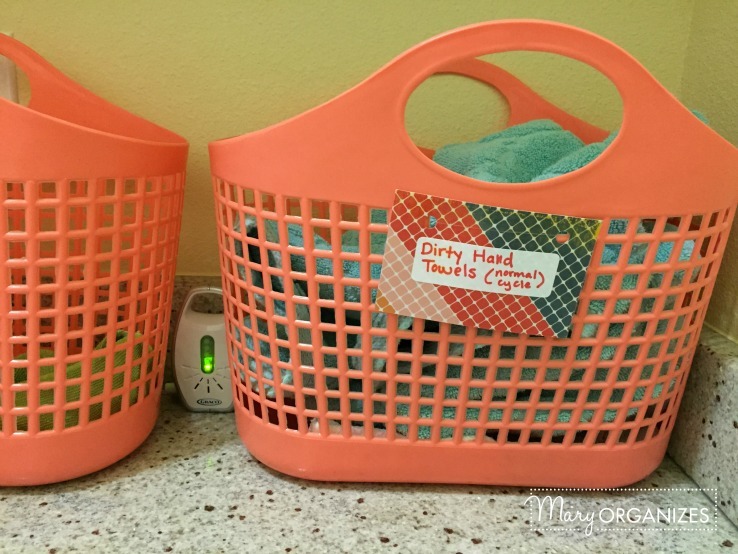 I added “changing the hand towel to the powder room nearby the laundry room” to my kids’ chore lists, so I needed to lower these baskets to the counter so my kids could reach to put the dirty hand towel inside. I wash those when we wash bath towels from upstairs. The other basket is for cleaning rags that need to get sanitized. I run that load about every 2 weeks when there is enough to justify it. 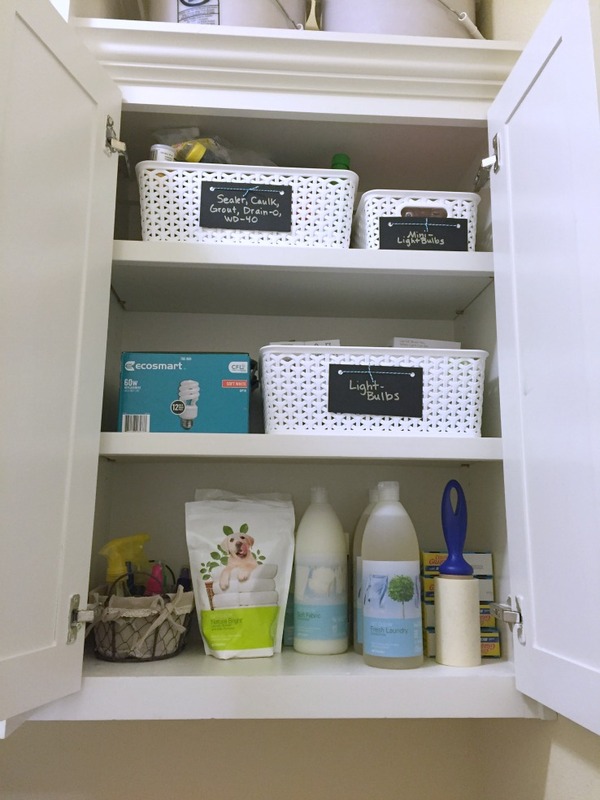 I’ve recently switched around the upper cabinet contents to an ordering that made more sense to me. Here are the cabinets above the washer. I keep paint and painting supplies up here. And no, it does not get hot in this cabinet. Speaking of heat, though – I see people keep paint in their garages, but we can get extreme summer heat in Arkansas and I don’t want to see what paint does when it boils. Here are the cabinets above the dryer. The top shelf is a random dryer part to attach when drying shoes, and then there are beach towels, my hand steamer, and some spare Shaklee cleaners. These are the cabinets above my counter. I keep my extra laundry supplies super convenient. Here is my version of a junk drawer, though I don’t call it that. I call it, wait for it … my laundry room drawer. The weird hose thingy helps me vacuum the deep part in my dryer’s lint area. Here is the cabinet under the drawer. I keep some clean & empty spray bottles that I occasionally need for gardening, hair, etc. This is the cleaning bucket carried around the house to clean. 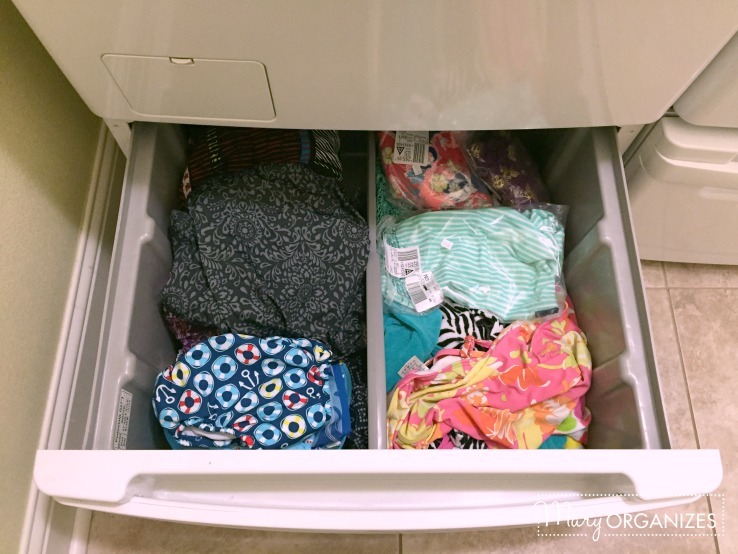 In the winter, I keep our swimsuits underneath my washing machine, inside of the pedestal drawer. This drawer looks empty in the summer. And underneath the dryer is all of my cleaning rags. I spared myself trying to make this drawer look perfectly neat in perfect piles. No one would buy that as realistic. 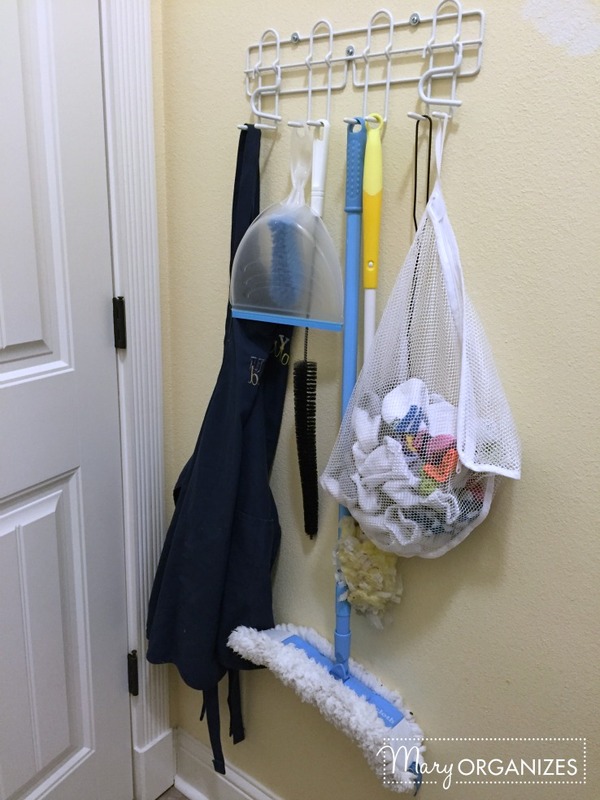 And now, for the moment you’ve been waiting for, behind my door I keep this hook rack with aprons, dusters, fly swatter, and … the big bag of my kids’ socks that I find shoved random places throughout the house. Seriously, random places throughout the house. You name a place, I’ve found a sock there. When I find a sock, I bring it to this bag. All my girls share socks anyway, so I just wash them and put them in their sock basket. On the top of my list to do when they each have their own homes: buy an economy size pack of socks and hide socks in their house when I visit. Of course I’m kind of joking … but am I joking? This isn’t even as big as this bag gets in a week. That is my laundry room. I know, your mind is blown. 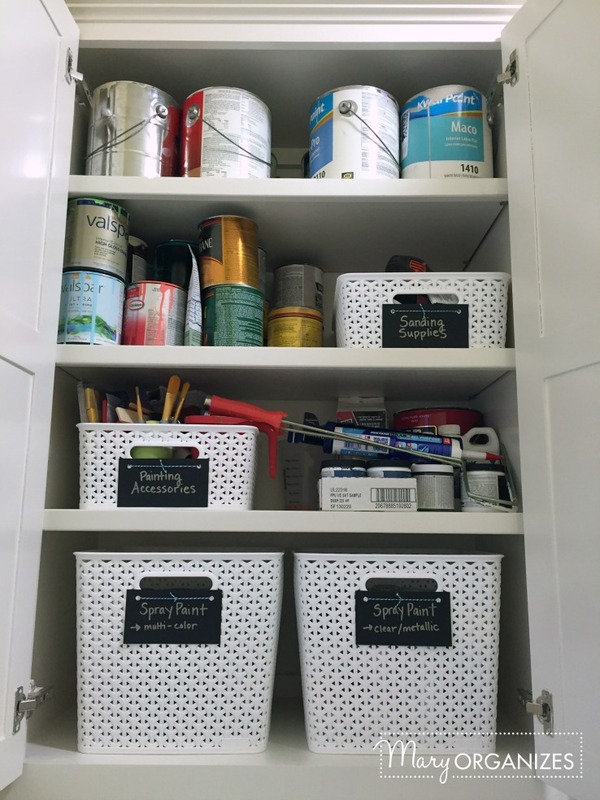 Or if it isn’t, maybe you have a few ideas or at least feel inspired to declutter your laundry room. Thanks Diane, I really appreciate your encouragement! Love the laundry room! But I am curious – where do you keep the iron, ironing board,and laundry basket? You’ve found me out – I don’t iron. 🙂 I keep my ironing board and iron near my sewing machine, because seeing is the only time it gets used. The one basket normally goes on the dryer top but was currently in the hands of the 2 year old during picture taking. I live in NW Arkansas too, but I never thought about the paint out in the garage. We have a lot. Maybe I need to check it? Bring them in? I appreciate you being realistic! As well as sharing what makes sense to you. This reminds me to put things that makes sense to me rather than whatever has been drilled into my head. I have a tall laundry basket behind the door in the corner. That’s where I throw my dirty rags. I love being able to throw dirty rags behind a door without looking and closing it. When has that ever been OK to throw dirty clothes behind a door? So I created a way that is exceptable and encouraged! When I’m ready to wash this load, I discover I’m a pretty good aim! You are too sweet. 🙂 This is your year – you can make it happen! Truth be told, many of my local friends think my thoughts on the paint are paranoid… But one of those friends had her less than 2 year old paint unusable recently. Not sure if it is the heat, but I’m not unconvinced enough to set my paint out in it! I keep mine in the water heater closet! (No gas here—totally safe.). The new formulations don’t last nearly as long. Love the idea of hiding socks in your kids homes 🙂 I have a permanent pile of my husband’s odd socks that I move around the home from time to time as I declutter – maybe this year is to throw those that have been there too long! It is time! Socks- be gone! Thanks for being more ocd than me!! Totally different question: is there any reason why the print(ing) on your declutter challenge is so light? I find it barely readable and I have/had a new black ink cartridge in my printer. It almost looks like an old carbon copy made with really old carbon paper. I tried it twice with same result and don’t want to do it again–just wasting paper. Thanks! Funny you say OCD, because I am definitely not! I just like simplicity and order, but not neurotic order… I try to stop myself before it goes there. About the pack, it might be your printer. I’ve tested on both my laser and inkjet and it is plenty dark. There may be a setting off with your colors. I am nearing the end of my 1st attempt at the 91 day declutter challenge in our utility room. I am really delighted at what I have achieved and just hope that everyone else puts things back in the space that they found them! I left a box of donations to the charity shop this morning and have filled 2 black bin liners with rubbish – so big success! I will post before and after photos later. I love the deep drawers that you have in USA. We don’t have them here (Ireland) and I’m nearly sure our choices of washing machine & tumble dryer colours are limited to white, silver and black! Thank you for your inspirational blog Mary. What an awesome first week. Imagine what it will continue to feel like week after week! I have two large laundry baskets, one for towels and one for everything else, plus one small one for socks. Do you have laundry baskets elsewhere in the house? What about an ironing board and iron? I keep those in my laundry room as well. I wish I had a place to keep the ironing board set up, but I really don’t. Thanks for the laundry room update! 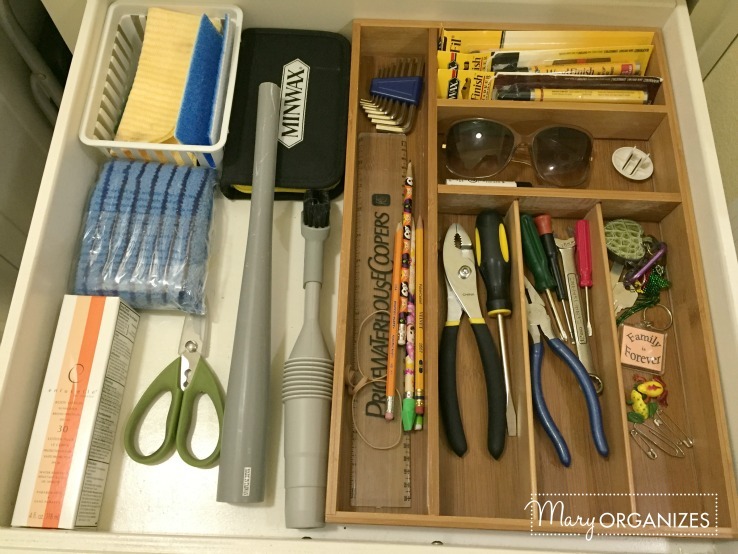 I really like the laundry room drawer – pinned it! I like the paint idea. I live where the paint freezes in the winter so I usually carry it to the basement but the laundry room would be much closer to where I actually use it. Thanks! I’m mostly surprised you didn’t find more socks, but don’t worry … You will. Some are hiding, it is their purpose. Thank you for this blog! I just signed up and so excited to start the new year organizing and decluttering. My word for this year is PURGE. Love your writing style and your tips. Thanks for the pics too, they are helpful. Great word! This is a good year for it! Great info. My laundry only has two upper cupboards but I like the concepts. Paint is easier in small containers with real lids aka screw tops for touch ups. I figure if I need more than that it will be time to re-paint – and maybe with a new color. Btw – put litter in the cans to absorb the paint before disposing in garbage. Helps keep toxins out of our water. I put all of my paint leftovers in large mason jars and labeled the lids with info (color name, place of purchase, where color was used). This way I can easily see the colors and can fit about 4 jars in the space of one paint can. 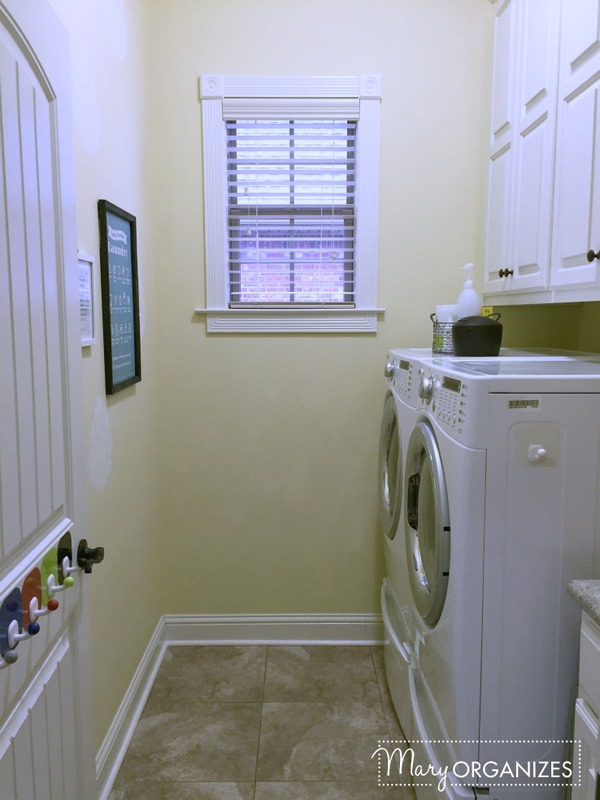 As a newbe to this challenge/ group I enjoy seen pictures of what your laundry room looks like. It helps me get his idea on how to store items. I hope you show your pictures of your house throughout this 91 day challenge . Thank you for everything that you were doing, my life seems less crazy, and I’m starting to enjoy hanging out in my own home . Question; do you have an idea, how to keep kitty litters looking all tidy in the laundry room? There is no other place in the house to put kitty litter’s, other than the laundry room. Help, I need some ideas. Thank you so much – I really appreciate that! … And as far as the kitty litter thing goes, I really don’t have any help. The thought of cats makes my eyes puff up 5 times their size. I am so so so allergic. I am unable to help my clients with anything cat-related. Best of luck! Mary, where do you get those laundry baskets with handles? 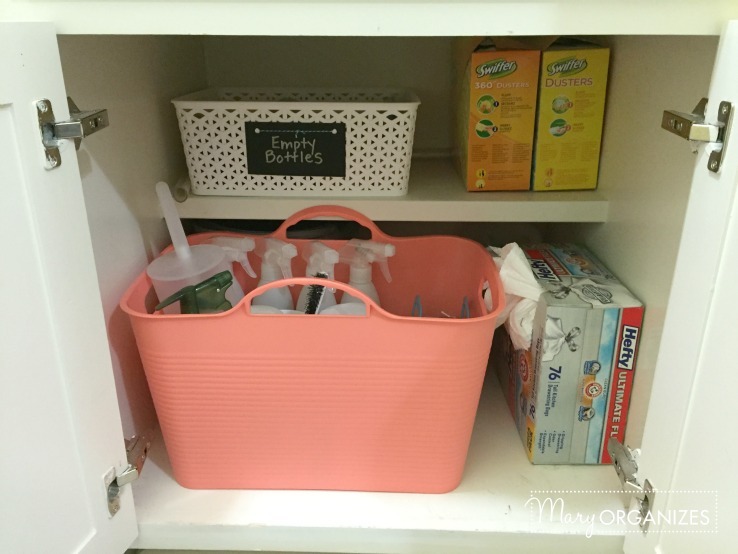 The baskets in this post – the pretty coral/pinkish ones are from Hobby Lobby and the white ones are from Target. Walmart also sells the white style in black and brown. I love them! You are not crazy about the paint thing. I’ve been told be several paint store employees that you should never store paint in the garage. They recommend storing inside. I store mine in the closet of the room in which it belongs. The main areas and other places that don’t have closets are stored in the laundry room cabinets. I was also told that the cans only last so long before the rust so one paint professional said if he has a relatively small amount of paint left in a can he’ll store the paint in a mason jar. The paint store can shake up the can before you transfer it and print out a new label for your jar. Ooh, I love the idea of letting the paint store help me do the transfers. Thanks for the tip! What a beautiful, inspiring laundry. I am determined to revamp my laundry now. My ironing basket is always overflowing. I wear things that do need an iron, ( or is that just my mother’s voice in my head – hmmm??). Perhaps this is a good place to begin the year – reducing the ironing pile and only buying clothes that won’t need ironing! My mom’s voice is in my head too. 🙂 I think your goals are lovely. Progress is what we’re after. I LOVE the random sock idea when your kids are grown. So funny! I love that you use Shaklee products! Happy New Year! Thank you for sharing your laundry room! My question – I’m considering a new washer/dryer set, the front-loader type. What kind is your’s and would you recommend it! Thank you!! These are LG Tromm, and I’ve had them for 10 years. They’ve needed simple repairs a few times, but are still going strong! Okay looks great but I’m confused where are the dirty clothes kept. Maybe I missed reading something but my basket is never empty and I using wash a load every night cause I do not wish to spend my entire Saturday washing laundry.